Right around this time of year, a couple of great seasons begin: the baseball season, hunting season, and, in schools, testing season. Educators across the country lament the emphasis we place on standardized, snapshot assessments – why, I’ve seen entire schools halt all new learning in favor of practicing, drilling, and preparing for the all-too-important state tests. Are learning test vocabulary, how to eliminate distractors, and writing to a prompt so important that we skip the 3 R’s for several months a year? Educators tend to have very strong opinions about this, and rightfully so: teacher tenure, evaluations, and job assignments sometimes hang in the balance. But what of the kids? What purpose do these tests serve for our students? If schools are indeed supposed to prepare our youngsters for the real world, how are these tests doing that? 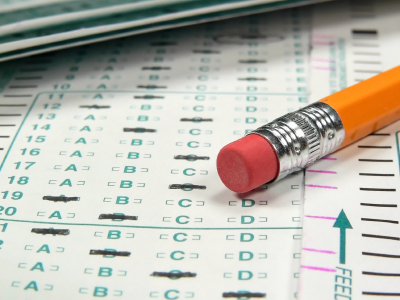 Are we, in fact, over-testing our kids? We know that assessments serve two functions: formative (guiding learning) and summative (tale of learning). Are these two dueling masters? Can we somehow use the information we collect for formative AND summative purposes? There are too many questions there for my 212 word blog to address, so I’ll need your help. What are your thoughts, experiences, and opinions? What are your suggestions for clarifying this murky water?